The budget-minded headset has great compatibility and sound that rivals its more expensive counterparts, but unfortunately fails to live up to Plantronics’ namesake with a middling microphone. The GameCom 780 marks an incredible about-face from other Plantronics’ wired headsets. While the previous GameCom 777 had the heft and inflexible bulk of a ginormous Chevy Tahoe SUV, the flashy and slimmed down 780 might as well be an economy-class Scion xB by comparison. The new design is still plenty boxy to give Plantronics an iconic look, but you no longer need to consult a physician about neck braces before wearing one. All of the excess plastic that made up the headband’s arms is now gone, swapped out for a pair of tough wire-frame rails on which the earcups can glide for size adjustment. The cans still have limited mobility and are only able to pivot up and down by a few degrees when worn, but they now have the ability to swivel backwards to almost lay flat on a table or stuff away in a backpack. The unwieldy control pod has also been nixed, replaced by a convenient volume rocker and microphone switch on the back edge of the left earcup. Likewise, the front edge of the same earcup has a button for toggling Dolby surround that glows blue when activated. Perhaps the boldest change made by Plantronics to their new headset is the elimination of the 3.5mm mini-jacks and optional Dolby dongle, making it so the headset can only ever connect via USB. Not that this matters if you only intend to use the headset with a PC or happen to write for a USB-focused website, but it does mean you won’t be able to jam out with the 780 and your MP3 player on an airplane. All in all these changes mean that Plantronics could shave a few bucks off the cost of materials, but it also means their new headset is one of the lightest and least intrusive ones I’ve used recently, ranking just below the Razer Megalodon’s level of comfort. The cloth-lined foam earpads are very soft and feature significantly less clamping than Corsair’s Vengeance 1500, but they do build up some heat in extended use and allow a bit more ambient sound to pass through at mid-low volume. For LAN gamers, however, the ambient sound is a major plus since it’s important to hear the cries of anguish from your friends across the table. 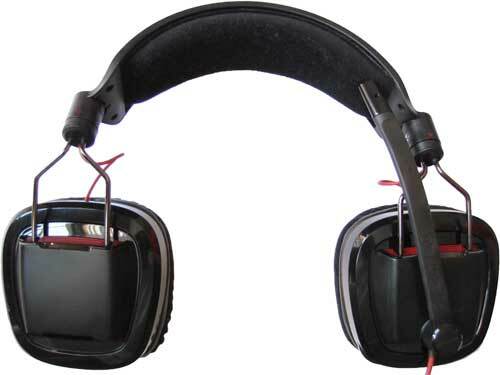 If anything, my only major grievances with the GameCom 780’s appearance are its BLEEDING RED USB cable and exposed cords that sit between the earcups and headband. I’m also not a fan of how short the USB cable is, coming in at only 6 feet such that I can’t wrap it around the back of my desk and monitor. Still, these complaints quickly fade when I remind myself that this headset costs $40 to 50 less than comparable offerings from the likes of Logitech and Razer. That’s enough dosh to pick out a new mouse or video game, or even go up a tier if you’re picking out a new video card. Not bad, Plantronics. A driver disc is included with the headset, but if you can spare 25MB of bandwidth I recommend that you just download the latest drivers (currently R2) since they have a few stability fixes over the first release. You can grab the latest release here. The drivers themselves are for a C-Media CM6302 codec, the same high-quality chip found in Corsair’s Vengeance 2000. 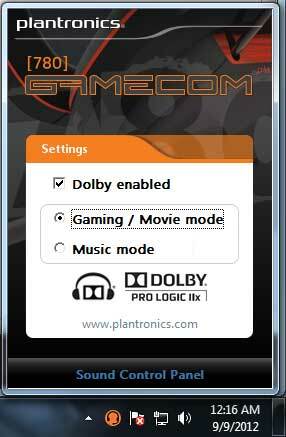 Rather than using C-Media’s typical software for user configuration, Plantronics has developed their own branded frontend to feature only the absolute essential feature you’d need drivers for in the first place: toggling Dolby. The gaming/movie and music options that you see below simply determine which mode Pro Logic IIx uses for upmixing content; movie mode makes better use of the center channel for vocals, whereas music mode is more evenly spaced out. Installing the drivers also introduces an audible tone whenever the volume is adjusted on the headset itself, accompanied for a half second by a spinning-circle mouse cursor. *Cough* There’s not much else to write about here. A graphic equalizer for tweaking bass levels and such would have been a nice addition, as would a built-in way to toggle the Windows speaker config or even adjust the virtual surround levels similar to what Logitech offers with their later headset drivers. I can’t figure why Plantronics went Playskool with their interface; the PC gaming community is naturally inclined to tweak settings – graphics details, button configs, macros – so why not give us control of our audio as well? Despite their oversimplification of the software, I will hand it to Plantronics’ development team for stability since I’ve not encountered any major bugs throughout my month of testing. Moreover, I’m incredibly thankful that they learned from past mistakes and left the speaker count as configurable in Microsoft’s Sound control panel. 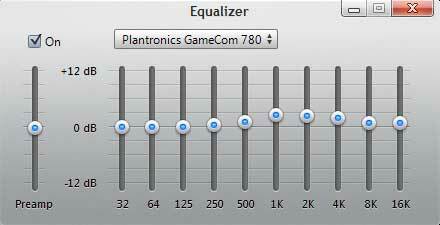 Here we can set the virtual speaker layout to stereo, quadraphonic, 5.1 side, or 7.1. This is a dramatic improvement over the GameCom 777’s stereo-only configuration, since it means that most games will detect your headset’s capabilities and output directional surround that actually works! I’m rather fond of the GameCom’s sound reproduction. Out of the box, the headset delivers plenty of low end punch and just enough high frequency response to make movies and games sound fantastic, clearly playing into the gaming and rock demographics. There’s not quite enough midrange present to really bring out the vocals and subtleties in nuanced music like Nine Inch Nails, however, but the midrange isn’t so lacking as to sound dull, either. Regardless, this deficiency is easily solved by slight EQ tweaks in programs that support it. Volume is ever present with the headset and just reaches the threshold where sound has the potential to become painful, so I doubt there will be many complaints here. The 40mm drivers also do well to retain their clarity up until around 90% volume, keeping all the sharp notes and bass kicks sound wonderfully clean throughout. There’s not much more I can ask of Plantronics for stereo sound at this price point; everything performs just as I’d expect it to as an avid FPS gamer. The Plantronics adds to a growing number of gaming headsets that make use of virtual surround sound instead of true surround sound, calling upon secret sauce algorithms to deliver a compelling 7.1 sound stage over only two speakers. The benefits for choosing this route over true surround are numerous; since Plantronics only had to fit one speaker in each earcup, they were able to utilize larger 40mm drivers with greater dynamic range than the tinnier 20-30mm drivers you see in true surround headsets. Fewer components in each earcup also means fewer potential points of failure, not to mention the reduced strain on your neck to carry them all. But what about the misguided criticisms that virtual surround is fake? That surround could not possibly exist without multiple speakers? Nonsense. When you think about it logically, you’re listening to surround every day with only two ears. It’s the delicate distortions in timing and intensities that allow you to pick out locations, and it’s only reasonable to expect that these distortions can be recreated in software. And while virtual surround may not feel as natural as everyday life since the algorithms are tuned for generic ears rather than your own, it certainly works well enough to get the point across that someone is shooting at you from behind. Plantronics decided to play it safe this round and go with Dolby’s well-established tech for their surround implementation, making use of Dolby Headphone to deliver the 7.1 experience and Dolby Pro Logic IIx to up-mix any 2, 4, or 6-ch content to all eight virtual channels. I found the 7.1 experience to be very compelling when I tested against Microsoft’s multichannel WAV file (.exe), with a clear distinction between all eight channels and minimal bleedover. Movies sound fantastic with Dolby enabled. Here again the headset’s punchy sound reproduction comes into play, delivering plenty of bass and sharp impact noises that make watching Black Hawk Down a treat. By selecting the 5.1 Side configuration in the Windows Sound control panel (default), Plantronics sets the sound stage exactly how Dolby intended it to be for DVDs and other Dolby Digital 5.1 content. That said, I’m still preferable to exaggerated rear surround for added effect. Thankfully this is as easy as setting the speaker count to 7.1 in Windows, thus forcing surround to play through the rear channels in both VLC and Windows Media Player. If you happen to be watching a TV show or DVD rip that has a Dolby Surround or Pro Logic mix, however, you’ll get much better results by switching the speaker count over to Stereo. This seems to offer much better focus for dialogue than simply leaving the headset configured as 5.1 or 7.1 all the time. I think Plantronics needs to do a better documentation job here for future driver releases and products; there’s nary a reference to the Windows speaker configuration that I’m able to find, and yet changing this setting to match the source audio makes such a noticeable impact! Listening to various genres of music also does well for the most part when Pro Logic is set to music mode, but here again you need to change the speaker config to Stereo to get the best results or else the music may seem out of focus. The virtual room size, while not configurable, seems to perfectly tuned so that live albums, orchestral tracks, chiptunes, and most rock music sound appreciably better with Dolby enabled. There’s never an overabundance of echoes, but some over-mixed or already spaced-out tracks such as Machinae Supremacy’s Winterstorm may feel a bit hollow if surround’s turned on. Obviously much of this comes down to subjective tastes, but I do think it’s worth trying at the very least. One of my biggest pet peeves with surround sound headsets is the lack of consistency for how well they work in games, even between two models from the same manufacturer released less than a year apart. Depending on how surround was implemented in the drivers, some games have working directional surround while others are left to rot in stereo land. This is a major cause for concern since there’s so many different audio APIs that power the games we play – Miles, OpenAL, XAudio, etc. The problem I see is that it’s not uncommon for headset manufacturers to skimp on the testing, blissfully unaware of any problems with their driver implementations until after the product ships. From there it can take a miracle to see a driver update that restores compatibility, and fellow reviewers hardly ever call the manufacturers out on these problems. All these tests done on the GameCom 780 were carried out on a Windows 7 x64 PC. Battlefield 2 Fail All combinations of settings result in stereo sound. Not surprising given this game has yet to work with any USB headset I've reviewed, even from Creative. Battlefield: Bad Company 2 Pass Surround works great! Call of Duty 4: Modern Warfare Pass 5.1 works great! Call of Duty 5: World at War Pass 7.1 works great! Call of Duty 6: Modern Warfail 2 Pass 5.1 works great! Crysis Warhead Pass 7.1 works great! Dead Space Pass 5.1 works great! Grand Theft Auto IV Pass 5.1 works great! Max Payne 3 Pass 5.1 works great! Portal 2 Pass 5.1 works great! Prey Fail Unable to initialize 5.1 surround sound due to Windows speaker count. The 5.1 option in Windows is configured as Side surround instead of Rear surround, which is not supported by the game. 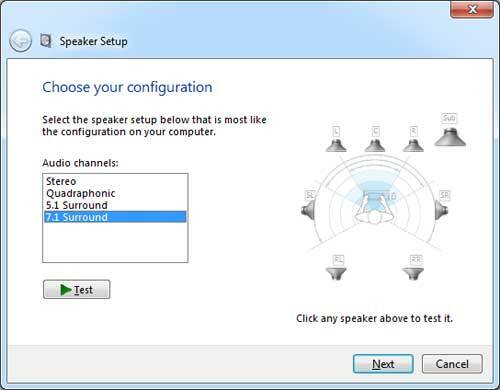 Quake 4 Fail Unable to initialize 5.1 surround sound due to Windows speaker count. The 5.1 option in Windows is configured as Side surround instead of Rear surround, which is not supported by the game. Rage Pass Surround works great! Serious Sam HD: The First Encounter Pass Surround works great! Unreal Tournament 3 Fail Stereo only regardless of OpenAL configuration setting. With just under 82% compatibility in my series of tests, the GameCom 780 easily meets the mark for a passing grade, though there’s still plenty of room for Plantronics and C-Media to improve their drivers. 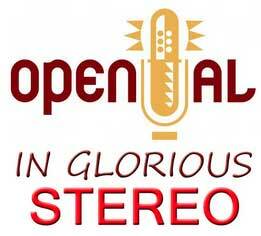 Stereo was the rallying cry for the handful OpenAL titles that were tested, including all of the Unreal-based games that didn’t implement a separate audio engine. There were also issues with the id Tech 4-based games, which count on the Windows speaker configuration being set to 5.1. Though Plantronics did include a 5.1 layout in the Windows control panel, since it’s listed as 5.1 side and not 5.1 rear, Quake IV and Prey both failed the test. The large majority of games I tested, however, did have proper surround sound. 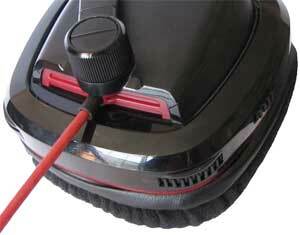 The GameCom 780 gives an especially sharp sense of direction, which makes homing in on enemies all the more natural. In-game sound stages all seemed very well spaced, enough to put you in the game but never to the point that it felt like an echo chamber. Moreover, while the quality of the surround was still largely dependent on the individual games, even weaker games like Modern Warfare 3 that are prone to channel bleeding sounded better than what I’m used to hearing. Plantronics bills their microphone as noise-cancelling, “effectively eliminating background noise so that your teammates can hear you clearly”. Though I agree that the microphone is indeed plenty loud and clear enough for friends and teammates to understand you over Skype and in-game chat, that’s not exactly a tough milestone to meet. The purported noise-cancelling properties of the mic, however, are missing in action. White noise is ever-present, even with the recording level set to 50% and the later R2 drivers installed. The seemingly-omnidirectional microphone also manages to pick up each and every keystroke, mouse click, and breath of air I take–no matter how the microphone is positioned. 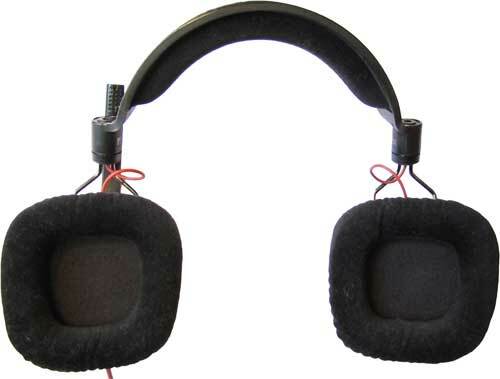 If you use this headset, I beg for the sake of your fellow team mates, use push-to-talk! This may seem like a tough stance to take on a relatively-inexpensive headset, but remember that Plantronics’ own namesake is voice communications. The GameCom 780’s microphone is unbecoming of that. In the same registry key that you found PLTGC.sys, you should see an “InfPath” REG_SZ string with a value of “oem##.inf”. Write down this OEM number, and close the registry. Download and extract the GameCom 780 drivers to a folder using 7-Zip. Navigate the extracted contents to \GC780-Installer-Release-2\U6302_120601-[your OS here]\SoftwareDriver\Driver\ and copy the “pltgc.cat” file. Rename the “pltgc.cat” file that you just pasted to “oem##.cat”, where ## is the number you wrote down in step 3. If this fixes your problem or you know of any other C-Media headsets with the same issue, please sound off in the comments section below. I think that the GameCom 780 is a huge step in the right direction for Plantronics. Extended-wear comfort is excellent and the placement of all buttons on the headset itself is a very welcome change, as is the greatly improved surround compatibility profile over the older 777 headset. The Dolby surround is highly directional and gives a good feel of in-game immersion without feeling hollowed out, and the punchy sound reproduction is also well-tuned for rock music and explosive FPS battles if not slightly lacking in the midtones. There are some areas that the headset does need a bit of work, such as the noisy microphone and frustratingly-short 6′ USB cable. The absence of a graphic equalizer and complete lack of surround support for OpenAL games are also a bit of a let-down, but these do have the small possibility of being addressed in a driver update if Plantronics can be convinced that these are features worth spending development money on. Despite these negatives, I still can not get over how well these cans sound for gaming and their overall comfort. With a current street price of $60 to 70, the GameCom 780 easily rivals headsets that cost $50 more, and is well worth checking out.